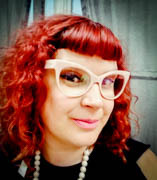 Jennifer Rupert (PhD University of Illinois at Chicago 2008) includes Transatlantic modernism, women's literature, feminist and queer theory, the history of sexuality, twentieth century visual culture, and contemporary critical media studies among her research and teaching interests. She has been awarded both the Chancellor’s INSPIRE Award and the Provost’s Award for Excellence in Undergraduate Advising for her commitment to undergraduate education. She has also been recognized by her students and the Department of English for outstanding teaching in literary and cultural studies. Rupert teaches undergraduate courses in first-year writing, literary theory and criticism, the history of feminism, gender and sexuality studies, critical media studies, and modernist literature. She serves the students in the Honors College as an instructor and Faculty Fellow. In 2018, she was a recipient of UIC’s Silver Circle Award for Teaching Excellence.